A First Time for Paula! 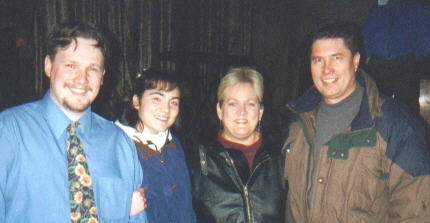 John had already been to teach at the Moldova Bible Seminary in May 2000, but this trip in February of 2001 was a first for Paula. One of the most difficult aspects of the trip from Paula's point of view were the very long flights there and back. She has claimed as her verse the passage that says, "LO, I am with you always..."
From right to left: Eugene and his fiance Ira with Paula and John. Eugene serves as the worship leader as well as Ron's regular interpreter and right-hand man. The ministry of Moldova Bible Seminary is about friends meeting friends. Jesus said to His disciples, "No longer do I call you servants, for a servant does not know what his master is doing; but I have called you friends" (John 15:15). One of the things we love to do is to introduce friends to friends. And evangelism is all about introducing people to the friend we have in Jesus.